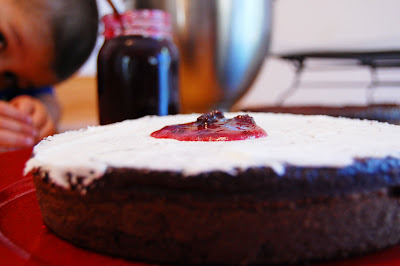 My favorite chocolate cake recipe from Hershey’s paired with homemade wild fruit spread and vanilla butter cream frosting for a taste sensation that is sure to have your mouth wanting for seconds. The secret to this cake is literally in the sauce. Note: I used wild picked blackberries and mustang grape juice. This recipe makes about 5 cups of spread. 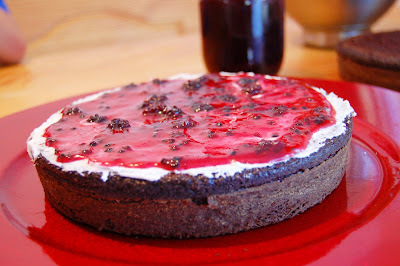 Mix together blackberries or raspberries, grape juice, lemon juice, and sugar over medium high heat stirring frequently. Allow to come to a full rolling boil for 2 minutes. Add liquid pectin, all at once, and continue to boil for three minutes, stirring constantly. Remove from heat. Can if desired or immediately refrigerate or freeze in 1 cup portions. You will use approximately 1 to 1 1/2 cups of spread for this recipe. Mix and bake cake according to directions on Hershey’s website or the back of the unsweetened cocoa container for two round 8 inch cakes. Cool cakes on waxed paper as this is a very moist recipe. Carefully remove rounded tops off cakes and blow/brush any crumbs away. 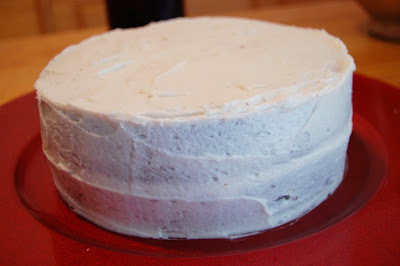 Spread a thin layer of vanilla buttercream frosting onto top of bottom layer of cake. 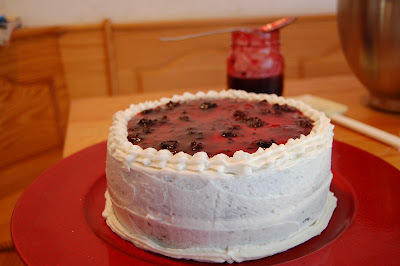 Spread 3 -4 tablespoons of Wild Fruit Spread onto frosting being careful to come just to 1/4 inch from edges. 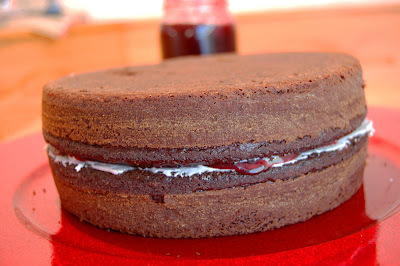 Place top layer of cake, cut side down, onto bottom layer. Frost cake with Butter Cream Frosting. 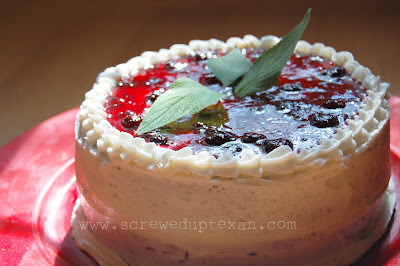 Pipe a decorative edge onto top layer of cake and carefully fill with more Wild Fruit Spread. Garnish with fresh mint or fresh pineapple sage.